Step into this eccentric Caterpillar costume and you’ll be the most stylish caterpillar around. The body suit is colored mostly dark blue except for the light blue stomach. Six blue arms with attached white gloves stick out just above the waist while six caterpillar legs with yellow slippers stick out from below. This comfortable suit zips down at the bottom to cover the wearer’s legs. 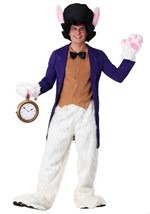 Don’t step into Wonderland without this authentic costume!